Once upon a time, when the i286 based computer with unimaginable 1 MB RAM was considered the most perfect system in the world, Sid Meier developed the Civilization and Microprose became a very popular company in all corners of the globe. A bit later, when the i384 and i486 computers arrived onto the market, almost everyone played or saw other playing the Doom from ID Software. Ten years passed away. The clock speed of PCs is now hundred times higher, the performance is incomparable, and games people are playing today are different. But the masterpieces of Sid Meier and John Carmack reappeared, like a Phoenix, in mobile phones. So, if you want to return to the good old days you can download a shareware version of Doom for the Nokia 7650 which was ported to the Nokia's platform by WildPalm. The shareware version contains 9 first levels, uses 4 sound channels and can work both in the full-screen and usual modes. But you must install a respective WildPalm's application for the Nokia 7650 or buy an additional module at $10 to have the sound. If you buy the base version of the game the sound will be set automatically. The game requires about 2 MB of memory. Sid Meier's Civilization was ported to Nokia's cell phones of the 9200 series by Redshift. The shareware version is already available at the company's site amd the full version will soon arrive at about $28. However, games for cell phones are not their primary advantage but a just pleasant add-on which lets us while away the spare time. Also, there are some other technologies which weren't taken seriously before and now paid much more attention. Some time ago OSGi (Open Services Gateway Initiative) announced a competition among companies for the best and original utilization of the OSGi technology to solve current pressing problems. The winner is Opensugar, a French company, whose Video Alarm Service allows users to observe live images from remote cameras and to be notified by SMS, MMS, or e-mail when motion is detected. The awarding ceremony took place in the headquarers of OSGi in Stockholm. Omnitel, Lithuanian cellular operator, found quite a curious use for its used prepay cards - it assembled a gigantic monument in the form of a cell phone. 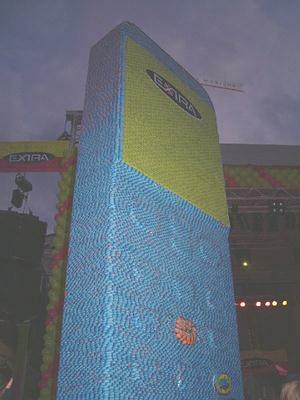 The phone 7.3 m high is made up of 700,000 EXTRA cards which had been collected around Lithuania during the summer and installed on the central square of Vilnius. It took three weeks for Kestutis Musteikis, author of the monument, to build it up. The sculpture was opened at the end of September, and the author thinks he's got every chance to get a record in the Guiness Book of Records. What's better beside connection: Internet, book reading or teletext? Beside establishing a network connection, games and multimedia messaging a modern cell phone provides one more service - an Internet mobile access. That was one of the key aspects in promotion of the 3G networks, together with multimedia capabilities that require a wide bandwidth. But it was impossible to realize quickly the 3G technology because of some economic factors resulted from the slowdown of development of the world economy and holes in the 3G conceptions. But despite the lack of success in promotion of the 3G NTT DoCoMo has voiced first encouraging results of development of the 4G networks started yet in 1998. The company said it had completed development of the technology that provides reception of data at 100 Mbit/s and and their transfer at 20 Mbit/s. But all those megabytes were achieved in the laboratory conditions, and who knows what speed can be in real conditions. The Japanese Ministry of Public Management, Home Affairs, Posts, and Telecommunications took care of development of the DoCoMo and it promises the final specs for the 4G networks by 2005 and the revenue service by 2010. However, long before the Internet became widespread (for the sake of which 3G and 4G are being developed now) there was such a service as teletext which transferred text information and provided some interactive elements. The Internet, however, couldn't kill it and made it acquire another form, and the teletext is still broadcast by many television companies. Nowire, Finnish company, suggests broadcasting it to cellular terminals. First time the teletext will be transferred via GPRS to Nokia Series 60 or compatible phones, in particular, Nokia 7650 and 3650. They are planning on broadcasting several channels in Italy, Netherlands, Slovenia, Sweden and Finland. And while the Finn are preparing texts for Nokia 7650 and Series 60 compatible models you can take up reading books on your phone. Thus, Epocware offers the Handy Book program meant for reading e-texts in the Palm DOC format. Books can be read in the full-screen mode and you can select a small, middle or big font. The Handy Book for the Nokia 7650 is available in English, German, Italian and Russian. Reportedly, the trial version can be downloaded from the company's site; the full version costs $15. But reading e-books on a mobile device is not a first on the market as this has been one of the greatest advantages of pocket computers. And what do you think about showing a presentation on a mobile device? A couple of years ago it wasn't supported even in pocket PCs, but the today's market offers a great deal of solutions supporting PowerPoint presentations on the Pocket PC platform and even on Palm computers. And now with the Pocket SlideShow from CnetX Software you can show presentations from a cell phone. However, at present the Pocket SlideShow is officially available for Smartphone 2002, though it works under the Pocket PC as well, but I can't say Smartphone 2002 based phones have overflowed the market. Here you can look through thumbnails of slides, use zooming and make notes, add and edit animation. At present it supports English, German, French and Italian, and Spanish will soon be added to the lot. The Pocket SlideShow is already chosen by Orange for its Orange SPV phones which are already selling in Great Britain, France and some other European countries. Looking at how the distinction between pocket PCs and cell phones is being eliminated, I recollect Steve Jobs, CEO of Apple, who mentioned that a pocket PC is a just a transition between notebooks and mobile phones. The phones look elegant. But Apple keeps silence, and we can't verify the rumors. In Q4 2002 Samsung unleashed three new models: A800, T400 and V200. The former must already appear on the shelves of the European stores while the T400 and V200 are expected in November and December. The SGH-A800 is equipped with two displays, the internal one has the resolution of 128x128 pixels. 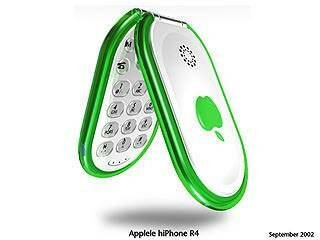 The phone has 16 ringtones, supports EMS, SMS and SMS-Chat. 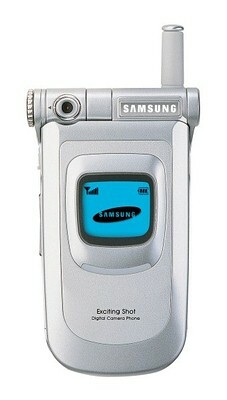 The feature set is similar to the Samsung N620, but the design reminds the Samsung T100. 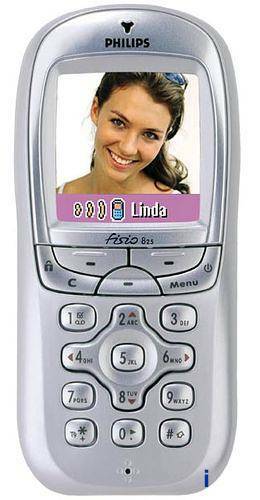 The latest model has about 300 KB for different applications (files, SMS, ring tones and pictures). Unfortunately, it's impossible to synchronize it with the Outlook. The A800 measures 40x22x80 mm and weighs 72 g. The recommended price is 350 euros. The SGH-T400 is expected in November. The T400 sports an improved color display of 128x144 pixels and supports 65536 colors. There are 40 ringtones. However, it doesn't support GPRS and MMS, only WAP 1.2 and EMS. The claimed run-down time is 5 hours in the talk mode and up to 150 hours in the standby mode. The phone measures 80x42x22 mm and weighs 80 g.
Finally, the SGH-V200 boasts a digital camera of 640x480 pixels and 300,000 colors. The TFT LCD display supports 128x160 pixels and 65536 colors. There are 3MB of memory to store shots or received pictures (MMS supported). Besides, it supports the GPRS Multi Slot Class 8. The dimensions are 91x48x23 mm and weight is 96 g. By the end of December the V200 will be available at about 700 euros. Siemens has most of all new solutions, though a great deal of them are meant for the North American market, and they were announced in New York. First of all, Siemens launched its new cell phone S55. This model works at 900, 1800 and 1900 MHz and supports Java, MMS (Multi Media Messaging) and Bluetooth. The S55 comes with a color display and new functions in the organizer. There is also an optional detachable digital camera. Above you can see an optional Bluetooth headset. 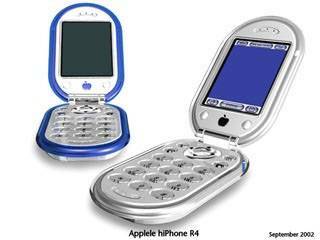 The phone comes also with a case and a Car Kit Cradle. Its dimensions are 101x42x18 mm and weight is 85 g.
Beside the S55 the company also developed its clone - S56, and SX56 communicator. 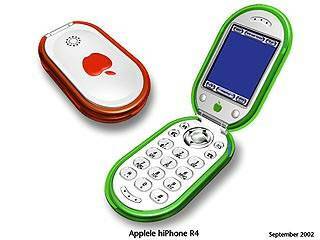 Both are developed for the North American market, and the latter is designed exactly for AT&T Wireless. Both solutions work at 900/1900 MHz. The SX56 combines capabilities of a mobile phone, organizer and MP3 player, has Microsoft Office and supports GPRS. The S56 is a simpler solution but it also can work with a camera, supports Class 10 GPRS, Bluetooth, J2ME, polyphonic tones and 256-color display. Voice dialing, voice commands and voice recording are also supported. 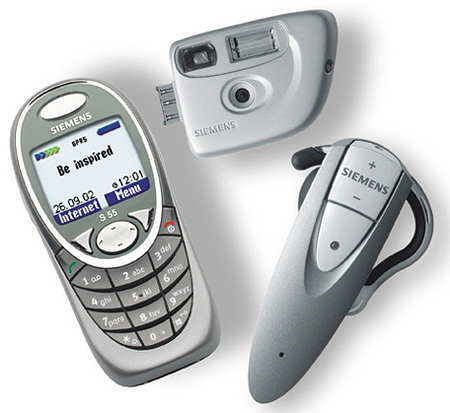 One more phone from Siemens is C56 and an exclusive version for Cingular Wireless, CT56. The main advantage is, according to Siemens, different ways of personalization. The CT56 will have 8 removable covers CLIPit, support EMS (Enhanced Messaging Service), GPRS, J2ME, polyphony, voice dialing and voice commands. 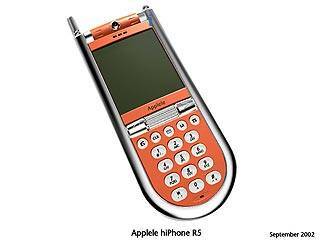 The CT56 will be sold only to users of Cingular Wireless, others can get the C56 with the same functions. The entry-level A56 is small and light, comes with CLIPit covers and supports GPRS and EMS. But the most wonderful solution is a 3G model U10. It supports W-CDMA and GSM/GPRS 900, 1800 and 1900 MHz. The U10 was developed in cooperation with Motorola, and the deliveries will start in December but only for certain European operators to be tested in their networks. The U10 has a built-in digital camera which can rotate at 180 degrees and record video clips. The high-speed Internet access is supported via WAP 2.0, at 384 Kbit/s, Java supported. 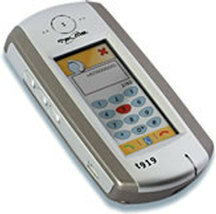 The phone incorporates the MPEG-4 codec and MP3/AAC decoder. The U10 has 2 MB memory which can be expanded. 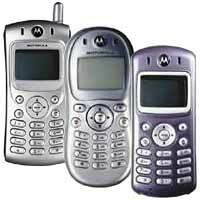 In October the company declared that the deliveries of the new multimedia phone Motorola T720 would start in November. Like in the Siemens U10, the digital camera can rotate at 180 degrees but it is not integrated. And the most pleasant news is that the claimed price for the T720 will be cut down from 569 to 349 euros. Motorola keeps on developing its conception of entirely customizable cell phone and it's going to launch a new series C330 where you can choose an exterior (color and case shape) and filling. According to PDA France, you can choose whether to have polyphonic ringtones or not. The C330 also supports EMS and it shows a picture of a calling person. The phone will have three games: AstrosmashTM, MotoGPTM, Snood 21. Philips stormed into the market with two new models: Fisio 825 and Fisio 625. The Fisio 625 that works at GSM 900 / 1800 is an updated version of the Fisio 620; it also comes with an E-Mail client, GPRS, speakerphone, displays a photo of a calling person (black-and-white one), supports EMS and polyphonic ringtones. An interesting smartphone based on the MS Smarphone 2002 is released by HTC. It has a sonorous name of Canary. Tel.Me came out onto the market with an interesting smartphone without a keypad: t919. A keyboard is realized in the touch screen. The Taiwanese company BenQ announced the release of its first phone supporting GPRS - BenQ M560G. 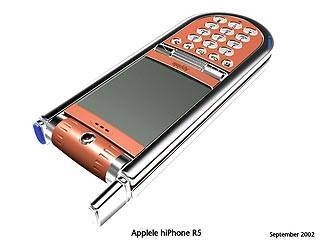 The M560G is meant for the youth (18 to 29 years old), it is equipped with a color screen and 16 polyphonic ringtone. There is a library of melodies (up to 300 entries), so that you can compose your own ringtone. And there are two games: Dance Dance and Air Hawk Space Shooting. By the year end the company will launch more new phones, mostly typical clamshells. By next year BenQ is going to increase its market share on Taiwan from 5% to 7%.